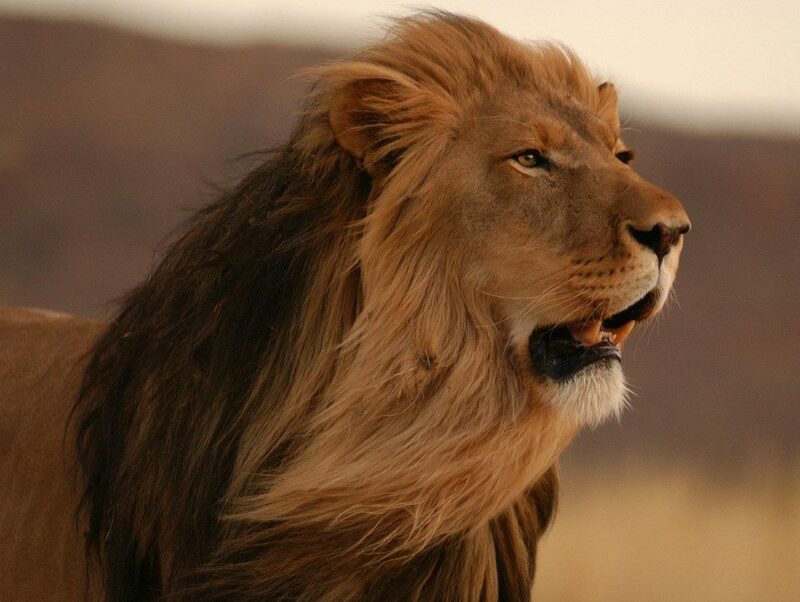 As the reserve becomes more established, so the game viewing is getting better and better – one area it does blow away other reserves though is in its fabulous scenery! 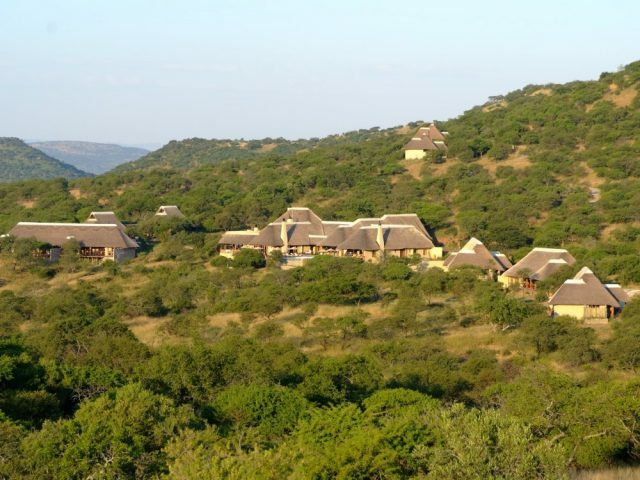 Nambiti Plains is situated in the extraordinarily beautiful and diverse landscape of Nambiti Private Game Reserve, just east of Ladysmith in close proximity to the Drakensberg and within fairly easy driving distance of both Johannesburg and Durban. The area around Nambiti has a firm footing in South African history with several battles of the Anglo-Zulu and Anglo-Boer wars taking place in this vicinity – in fact many of these battlefields have been preserved as reminders of the rich history! Previously this land was under cattle and maize farming, but mates Rob le Sueur and Gordon Howard had a dream of a Big Five game reserve close to Durban - a couple of years in search of the perfect piece of land finally led them to Nambiti where they were amazed at the outstanding natural beauty of the area. The duo set about purchasing the old farms and a long process of removing fences and alien vegetation began as well as reintroducing many species of game –it has been hugely successful and the reserve is now home to over 40 species including the Big Five and other species like cheetah as well as 280 bird species! As we mentioned previously, one of the most attractive elements about Nambiti is the spectacular and diverse scenic landscapes! 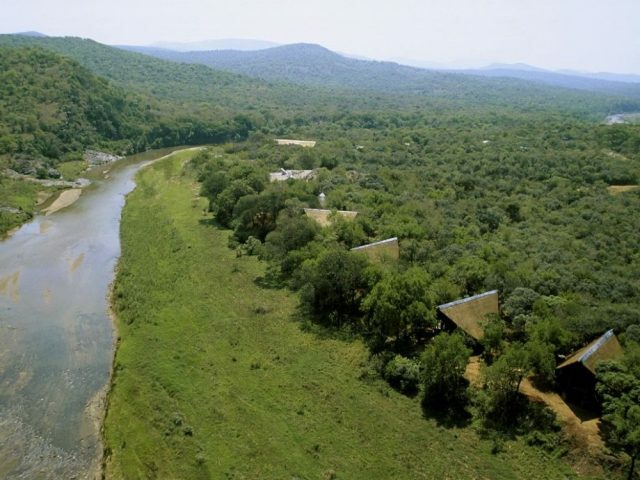 This reserve’s 9 000 hectares of malaria-free bushveld boasts everything from massive grassy plains reminiscent of the Serengeti, through thornveld covered hillsides to the Sundays River which tumbles over a series of waterfalls as it makes its way through the reserve! Unlike many of the other lodges which are based either in the far south or north of the reserve, Nambiti Plains is located pretty much slap-bang in the middle of the reserve. Whilst it may not have the most spectacular setting out of the lodges in Nambiti, the lodge’s location gives it one significant advantage in that you're already in the heart of the reserve's prime game viewing areas! Nambiti boasts a selection of superb lodges with something to suit just about all tastes and budgets - Nambiti Plains is one of the reserve’s top-end options, an eco-friendly beauty which comprises of 7 luxurious suites - 3 standalone Honeymoon Suites as well as 4 Luxury Suites consisting of 2 pairs of connected units (families can book adjoining units) Being literally twice the size (90 sqm versus 45 sqm) our pick would be one of the Honeymoon Suites, particularly because the price differential is minimal over the smaller Luxury Suites - the Honeymoon Suites also boast outdoor showers which is one of our personal faves! As far as the lodge is concerned, it’s set on a gentle slope with views out over the rolling plains of Nambiti with a nearby waterhole. 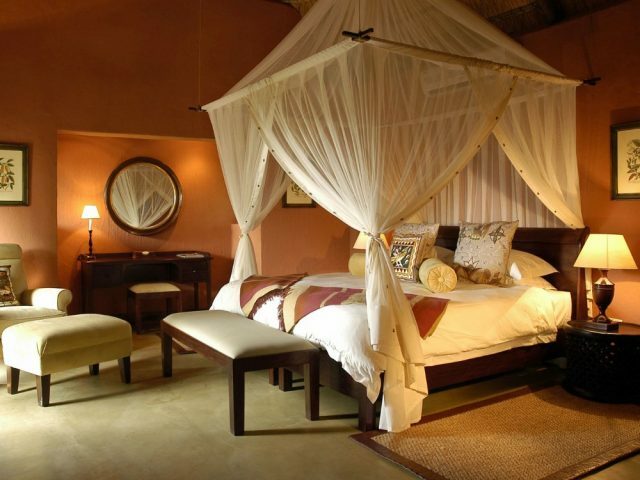 Each suite is completely secluded and hugely spacious and comes equipped with romantic mosquito nets, overhead fans - whilst the style is quite rustic with open thatched roofs with exposed ceiling beams, stone-packed feature walls and screeded floors, it’s all quite luxurious too. You can immerse yourself with 180 degree panoramic views from the bath, outdoor "bush shower" (in the Honeymoon Suites), and private wrap around viewing deck. We particularly like the massive bathrooms where twin basins are framed by old tree trunks and there’s a gorgeous standalone bath which could almost feel outside once you slide back the huge floor-to-ceiling sliding doors! The Luxury Suites are two separate semi-detached rooms per unit, separated by a solid, packed stone wall with a common entrance and also offer families space to enjoy the beautiful views of the bush. 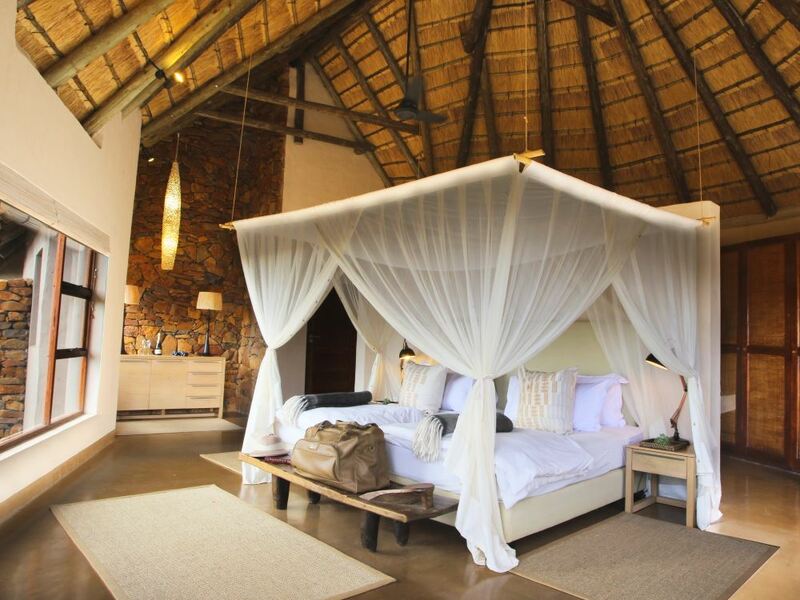 The main lodge follows a similar traditional game lodge design style with its thatched roofs and wooden viewing deck – the stone-packed feature walls are particularly attractive. The lodge's emphasis is on a modern yet eco-friendly minimalist approach with the lodge also located right in the bush with no manicured gardens, thereby reducing the impact on the surrounding environment.The lodge has glassed sliding doors, overhead fans and screened floors which ensure you stay cool in summer while large, beautifully constructed packed stone fire places in the bar, lounge and dining room. The lounge area with its huge fireplace is a great spot to relax on a comfy sofa with a glass of good red wine on a chilly evening in front of a roaring fire! During the day the place to be is the vast, expansive wrap-around deck complete with circular plunge pool - this is the ideal area to relax with an ice cold beer or chill out in the outdoor lounge as you watch animals quietly drinking and bathing in the waterhole in front of the lodge. In fact you may find yourself sharing the pool with a herd of ellies as they seem to have mysteriously developed a taste for the crystal clear swimming pool water over that of the waterhole! Nambiti Plains is certainly not the place to come to lose weight and dining is an experience to be enjoyed either in the privacy of your deck, dining room, under the African sky in the atmospheric boma around a blazing bonfire or in the bush for a truly African experience. There’s very good game viewing at Nambiti with at least 4 of the Big Five likely (leopard sightings are improving but they remain elusive) but what we particularly enjoyed during our game drives in Nambiti was the stunning scenery, especially the spectacular waterfalls on the Sundays River! That’s not all that’s available though, with battlefields tours and fishing on the Sundays River just a couple of the other activities available. What’s pretty certain is that the memory of your stay in this incredible place will linger for a very long time!